"Vapor Trails Japanese Release Linernotes Essay by Mike Portnoy"
Rush's impact on mine and Dream Theater's lives and career is immeasurable. I think it is pretty safe to say that if it is weren't for Rush, there would be no Dream Theater! When I met John Petrucci and John Myung at the Berklee College of Music in the Fall of 1985, there were two immediate things we found we had in common: 1. our homebase of Long Island, NY and, 2. our love (no...make that OBSESSION) with Rush. Right from the very first rehearsal, we began jamming on all of our favorite Rush songs: The Spirit of Radio, YYZ, La Villa Strangiato. We found a common language of musical communicarion between us that stemmed from this music that we loved with all of our hearts, souls, minds, hands and fingers. We were 3 Rush fans who were so inspired by their musicality and obvious personal comradery, that we decided to devote our lives and careers to making music from a similar blueprint and background. Even the band's original name Majesty stemmed from a description one of us used to describe the ending of Rush's Bastille Day that we were listening to while sleeping out for tickets for their Power Windows tour! But the most shocking thing to us is that there seems to be a whole new generation of progressive music fans (especially throughout Asia and Europe) that have started their journey of progressive music with bands like Dream Theater...and unlike us, haven't necessarily had the exposure to and influence from some of the pioneer bands that created this unique genre of music. If you are one of those lucky people, I must say I ENVY you!! You have a tremendously rewarding musical journey lying ahead of you. I cannot begin to tell you how incredibly inspirational my first experience of discovering albums like 2112, Hemispheres, Permanent Waves and Moving Pictures were. The thought of some of you being able to listen to those albums for the very FIRST TIME, is something I truly do envy! If you are already a Rush fan, then you realize how special today is: you are holding in your hands THE BRAND NEW Rush CD!!! An occasion such as this used to be a national holiday in the Portnoy, Petrucci and Myung homes. 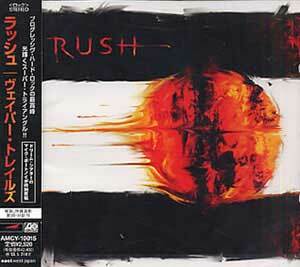 And this is a CD that many Rush fans feared would never be made. Although I cannot say I ever doubted their return, it does happen to come off of a 5 year hiatus which is the longest in the band's career. And it is obvious that they have come back with a vengeance. All of the classic Rush qualities are intact: Geddy's totally unique voice and virtuosic bass playing, Alex's chordal guitar textures and wall of sound, and Neil's legendary drumming and breathtakingly poetic lyrics. But there is also an obvious new sense of exploration. The playing is fresh and vibrant. The songs are immediate yet constantly venturing into new territories. The production is tight enough to be crisp and balanced yet loose enough to feel their new surge of life.